On Saturday morning, my three-year-old enjoyed bubblegum-flavoured cotton candy for breakfast. 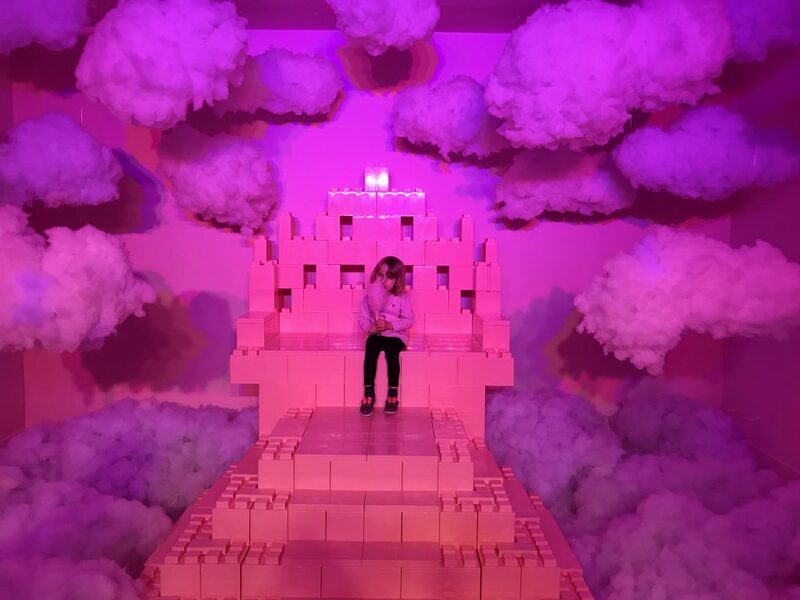 While I’m sure her dentist wouldn’t have approved, my daughter loved it; she devoured the sticky, sweet stuff while sitting on a throne built of giant, fake Legos, surrounded by fluffy white clouds. No, I wasn’t having some kind of sugar-induced dream; I was at HideSeek, one of Toronto’s newest installation exhibits. 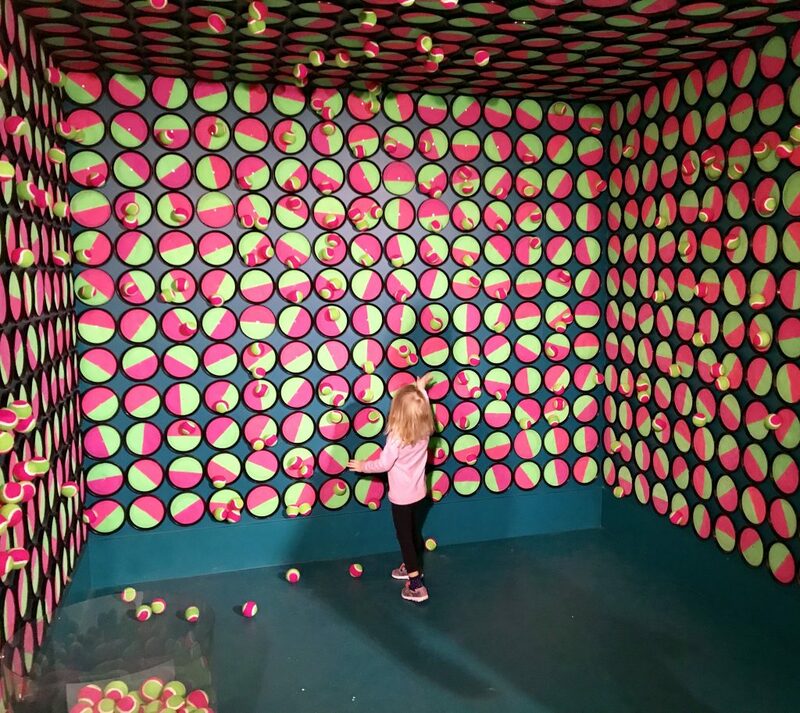 Self-described as “an immersive pop-up experience inspired by childhood nostalgia,” HideSeek is one part nineties-flashback, one part Instagram paradise and one giant dose of fun. While its target audience is millennials with well-curated social media profiles, HideSeek’s focus on childhood also makes it a fantastic spot for actual kids. My daughter loved all bright colours and cool textures and of course the aforementioned cotton candy. That appears roughly halfway through the exhibit, in a room where you can also chew on Rocket candies and DoubleBubble while writing on the walls and posing with giant, school-themed props. Yes, the whole thing is kind of silly but that’s the point. Sometimes it’s nice to take a break from reality and enjoy what HideSeek calls “real life recess,” especially when that experience comes with a soundtrack that features such essential ‘90s artists as Britney Spears, Destiny’s Child and Aqua. There are a total of 12 individual installations. While we liked all of them, my favourite has to be the adult-sized ball pit. It really did make me feel like a kid again (and pushing through all those balls was actually a pretty good workout). My daughter’s preference was for the fun fur room (she wanted to cuddle up and take a nap with its fluffy pillows) and the slinky room, which features 2,500 slinkies. Meanwhile my husband, who’s usually stiffed-lipped at these things, even cracked a few smiles and particularly enjoyed the installation that involved Velcro paddles and balls (remember those?). Besides being just plain fun, HideSeek does indeed provide some great photo opportunities. There are even a few employees on site who can take a group shot for you. If you’re thinking that HideSeek sounds like something that could have long lines well, you’re right; the potential is certainly there. Our tickets were for 10 am, a time slot I’d chosen to try and avoid the crowds (once you’re in the building, you can stay for as long as you want). We showed up slightly before 10 and I fully expected that after a few minutes wait, we’d be able to walk right in. But to my surprise, several people were already queued up (and very quickly another dozen people were behind us). I begin to worry that my strategy had failed and that our experience was going to be a series of lines. Thankfully, that turned out not to be the case. Yes, we did have a bit of a wait to get into the first exhibit but that’s because the usher/ticket taker seemed to be waiting for guests to clear the first installation first before allowing the next group in. It’s a smart approach and one that did seem to help minimize bottlenecking. Once inside, we rarely had to wait more than a minute or two to pose with an installation. We never felt crowded or like cattle and had ample time and opportunities to take photos and explore the installations. HideSeek says that you should allow around 45 minutes to get the full experience. 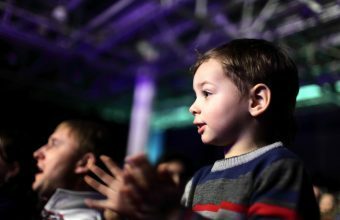 However, depending on how fast the crowd ahead of you is moving, and how long you linger in the cotton candy room (you need to finish your treat before you can move to the next installation), you may find that your family takes longer. Since this event is so heavily aimed at millennials, I can see it getting busy later in the day or at night. If you do check it out, try to go early in the day or even better, on a Thursday or Friday afternoon, when crowds should be at their lightest. Tickets for HideSeek are $25 (plus taxes and fees) a person, with kids three and under free, so this isn’t exactly a cheap outing. However, it is the rare event that doesn’t have any additional costs. Once you’ve bought your ticket, you don’t have to worry about shelling out more for snacks, souvenirs or having to deal with a gift shop meltdown (yes, the cotton candy and other treats are included in the price of your ticket). While HideSeek might not be the cheapest way to kill an hour, it is a memorable way to celebrate your children’s birthday or another big event. I would definitely recommend it as a fun and appropriately priced way to commemorate a special day. To get the most out of your ticket, consider your children and their tolerance for waiting in line. While kids of all ages will certainly have fun at this event, you’ll enjoy it too if you attend it with people who have patience. Dates: HideSeek runs from now until June 2. Parking: No on-site parking but there is street parking, including immediately in front of HideSeek’s building. There’s also a Green P lot at Dovercourt Rd and Harrison St. Transit: HideSeek is located right on the Dundas (505) bus route and both the Lisgar and Dovercourt stops are a short walk away. Ticket Price: $25 with kids three and under free; be sure to buy them in advance as none are available at the door. Stroller Situation: All strollers must be parked (for free) in the coat check area. Lindsay is a Toronto-based freelance writer. She writes about whatever catches her interest (and imagination) and has had bylines for Buzzfeed, Chatelaine and Today's Parent. She's also the mom to a wonderful little girl and the pet-parent to an American Eskimo dog and a chinchilla.